In a way it’s very unfortunate that both the Microsoft and Apple events are on in the same week. For a start, it’s meant an awful lot of work for me trying to cover off the two events (4 hours sleep last night, sob). Secondly, I’m going to have to put my neck on the line a second time in quick succession and make predictions I’m not 100% certain of, which I generally don’t like doing. In fact, this one is far more complicated, convoluted and speculative than anything I’ve blogged about before, so please bear that in mind. I am a commercial litigation solicitor/lawyer specialising in trademark law and intellectual property. Being a commercial litigator is something like being a poker player, in the sense that you study the facts as you understand them, and you try and understand what your hand is, and guess or put together what your opponent’s hand is, and then you advise your client on the various risks and prospects of success, on the ‘balance of probabilities’. That’s the key. Unlike in criminal law where most things generally have to be decided ‘beyond reasonable doubt’, when it comes to civil litigation in most countries, the burden of proof is about what’s more likely on ‘The Balance Of Probabilities’. This is how, for example, OJ Simpson can be found not guilty of murder, but civilly responsible for the death of his ex-wife. So, that’s what I’m all about, assessing the facts, and deciding on the balance of probabilities whether my side of the argument is more likely to be true, or be held to be true, than the other side. So in the case of ‘Magic Toolbar’ on balance it seems hugely unlikely to me that the applicant company in that case could be anyone other than Apple. It is however still possible that it’s not Apple. That’s the nature of the gamble, and I made that clear in my post at the time. If it’s not in the company’s name, you can’t be 100% sure. Ever. So, with that out of the way, what do I know? This is isn’t a balance of probabilities, it’s a 100% fact. Does that definitely mean that something specifically called the ‘Surface Laptop’ is going to be revealed on Wednesday? No. Not very exciting, granted! It has been well publicised that Microsoft was updating Paint, and that it was going to have 3D Capability. There’s a leaked video doing the rounds showing the features as well, though to the best of my knowledge, the name isn’t’ confirmed. Now, onto the interesting stuff…. Unlike the Apple Prediction about the Magic Toolbar, the evidence here is definitely not as clear cut, however, and there’s far more of a chance I’m wrong. However, after doing this long enough, and seeing enough trademark applications, it all becomes a bit like the Matrix, and you can just spot a glitch a mile off. Something about these three trademark applications stands out. I’m going to give you all the evidence I have, and then you can make up your own minds as to where the balance of probabilities falls. 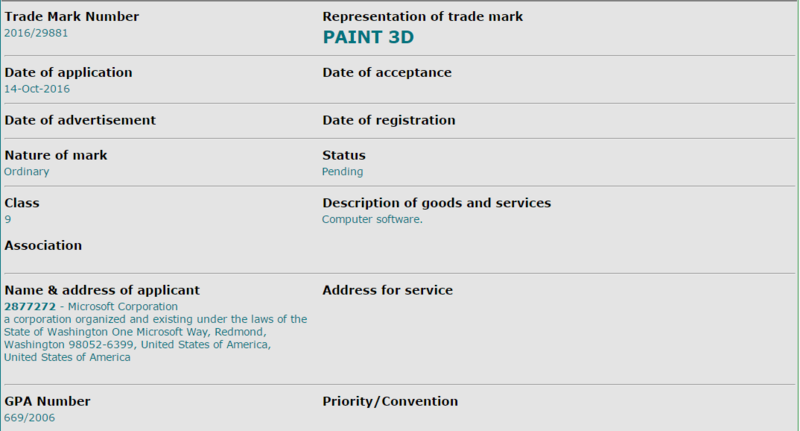 The First Global (WIPO) Microsoft Surface Trademark Application was filed on 10th August 2012, based on a US priority application dated 15th June 2012. Computers; tablet computers; laptop computers; mobile computers; reader for e-books and other electronic publications; computer peripherals; wireless computer peripherals; mobile communications modules for use with tablet computers; headphones; audio speakers; computer keyboards; computer mouse; webcams; digital pens; power cords; battery chargers; electrical cables and cord sets; electronic docking stations; computer docking stations; adapters for use with computers and computer peripherals; usb hardware devices; carrying cases and holders for electronic equipment, namely, tablet computers, laptop computers, mobile computers, computer peripherals, readers for e-books and other electronic publications, and computer accessories. Now, Microsoft are a PRETTY well known company, right? So, if you were going to launch a tablet computer, or indeed any computer onto the global market in 2016, you’d probably be aware of them, and be aware that they had a product called the Surface, isn’t that fair to say? Well, I think so too, which is what made me suspicious when I found a trademark application for ‘Surface’ lodged by a company in Slovenia. So why would you establish a company in Slovenia, then apply for a trademark for ‘Surface’ at a local level, then apply internationally and go up against the might, money and power of Microsoft? Who would do that?? Well a Slovenian company did anyway. računalniški software, računalniški hardware, računalniške strojne periferne enote, oprema za računalniško strojno opremo, računalniki, prenosni računalniki, tablični računalniki, računalniške miške, računalniške tipkovnice,mobilni računalniki, ročni računalniki, mobilni telefoni, periferne enote za mobilne telefone, komunikacijske naprave za mobilne telefone, ročne mobilne digitalne elektronske naprave, ki lahko zagotavljajo dostop do interneta in pošiljane, prejemanje in shranjevanje telefonskih klicev, faksov, elektronske pošte in drugih digitalnih podatkov; deli in oprema za ročne (prenosne) in mobilne digitalne elektronske naprave; deli in oprema za mobilne telefone; omrežne komunikacijske naprave, elektronska komunikacijska oprema in instrumenti; telekomunikacijski aparati in instrumenti; telefoni; brezžične komunikacijske naprave za prenos govora, podatkov ali slike; pedometri; večnamenske elektronske naprave za prikazovanje, merjenje in nalaganje informacij na internet, vključno s časom, datumom, srčnim utripom, globalnim pozicioniranjem, smerjo, razdaljo, višino, nadmorsko višino, hitrostjo, ritmom, narejenih korakih, porabljenih kalorijah, poteh, navigacijskimi informacijami, informacijami o vremenu, temperaturi, hitrosti vetra, spremembami v srčnem utripu, ravnjo dejavnosti, prespanih ur, kakovosti spanja in informacijami o tihi budilki; večnamenske elektronske naprave, ki se povezujejo na mobilne telefone in naprave za nadzor glasnosti in obvestijo uporabnikih o dohodnih klicih ali sporočilih; programska oprema za mobilne telefone; računalniška programska oprema za uporabo na ročnih, mobilnih digitalnih elektronskih napravah in drugi zabavni elektroniki. computer software, computer hardware, computer hardware peripherals, equipment, computer hardware, computers, laptops, tablet computers, computer mice, computer keyboards, mobile computers, handheld computers, mobile phones, computer peripherals for mobile phones, communication devices for mobile phones, handheld mobile digital electronic devices, which can provide access to the Internet and distributed for receiving and storing of telephone calls, faxes, electronic mail, and other digital data; parts and accessories for handheld (portable) and mobile digital electronic devices; parts and accessories for mobile telephones; network communication equipment, electronic communication equipment and instruments; telecommunications apparatus and instruments; telephones; wireless communication devices for voice, data or images; pedometers; Multifunction Electronic Display Devices, measuring and uploading information to the Internet, including the time, date, heart rate, global positioning, direction, distance, height, altitude, speed, rhythm, made steps, calories, routes, navigation information, information weather, temperature, wind speed, changes in heart rate, activity level, sleep hours, sleep quality, and information on silent alarms; Multifunction electronic devices that connect to mobile phones and devices for volume control and notify the user of incoming calls or messages; software for mobile phones; computer software for use on handheld, mobile digital electronic devices and other consumer electronics. Now, that SAME Slovenian company just 4 weeks ago on 26th September 2016 then applied for Global Trademark through the Paris Convention via WIPO (don’t worry about it) for ‘Surface’ based on that initial application in Slovenia. Will Microsoft Object to the Application for a Trademark for Surface? So, what we have here falls under that description in my view. The application by the Slovenian company is an application for an identical mark (namely ‘Surface’) for identical goods or services in respect of some of the goods, and will not be granted for those goods unless Microsoft allow it and raise no objections. It could however, withdraw the conflicting goods on its application and still try and get it through. That’s a LOT of money to pay for a trademark application that has zero prospects of success in some of the key classes of goods, in my humble opinion. And they will have serious difficulty with the rest of the goods if Microsoft Objects to them. Protectors in the form of films for mobile phones; Protective films for electronic apparatus, namely: mobile telephones, smart watches, GPS navigation devices, cameras, digital cameras, photographic cameras, digital photographic cameras, video apparatus; Protective films of safety glass adapted for mobile telephones. So, no, Microsoft will not allow this to stand. So I decided to dig deeper, and that’s where things get really interesting. And the rumour is that Microsoft are revealing an all in one desktop on Wednesday. Don’t know about you but ‘Surface Studio’ seems like a pretty good name for something like that to me. A couple of important things to note about Živko Mijatovic & Partners d.o.o. Firstly, according to their website, they are “a full service Intellectual Property Law Firm” who excel “at highly effective, strategic and efficient trademark portfolio management“. I bring this up because, you know, they obviously know a thing or two about trademarks. So they would know that if you apply for an identical trademark for identical goods and services, it’s going to be refused. Oh, and there’s another thing, the same firm has applied for about 60% of Microsoft’s trademarks in Slovenia since 1989. So you’d have to logically assume they would be well aware of the existence of Microsoft’s surface trademark, right? So, here’s where we are SO FAR. The firm that has historically advised Microsoft on it’s trademarks in Slovenia, has now applied on behalf of a company called Svetovne tehnologije d.o.o. for trademarks which on their surface appear to be in direct conflict with Microsoft’s existing trademarks. While that might initially seem unusual, if Microsoft are no longer a client, and another client wants to register Trademarks that could potentially conflict with those of the former client, there isn’t actually any reason for Živko Mijatovic & Partners d.o.o. to not act for that new client and process those applications. According to the records which I was able to access (and assuming the accuracy of them, you can see them yourself by clicking on that link) Svetovne tehnologije d.o.o.was incorporated the day before those original trademarks were filed in Slovenia, and according to Biz.si, the 100% registered owner of the company is the Slovenian arm of Živko Mijatovic itself and the registered address of the company is at the same address as Živko Mijatovic & Partners d.o.o. also. So, it appears that either (1) Microsoft are behind these applications, or (2) the Law Office that represented Microsoft in Slovenia in relation to 30 out of 50 of its trademark applications in that country has incorporated a company, of which it is the registered 100% owner, and then the very next day applied for Trademarks for an identical term that Microsoft already has trademarks for, for some identical goods and services, and then applied for global trademarks for them. Ladies and Gentleman of the jury, I rest my case, now it’s in your hands to decide, on the balance of probabilities, whether the applications are made with Microsoft’s knowledge or not. If you’re still reading, then you must (like me) think that there’s at least a chance that Microsoft are actually behind the trademarks. 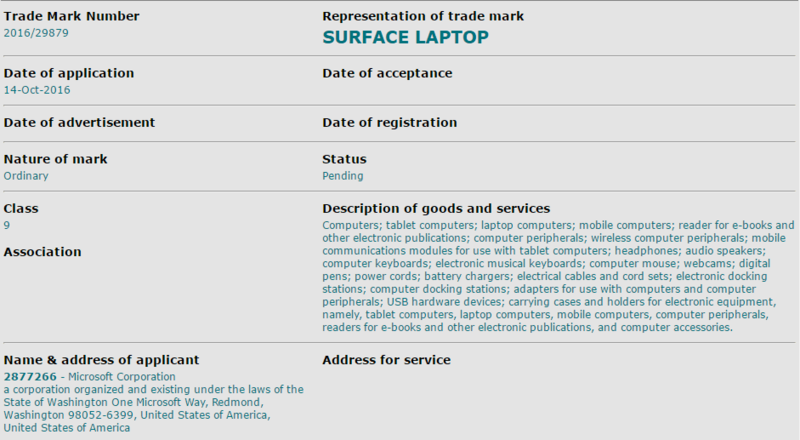 So, why would Microsoft register ‘Surface’ again, when it already has a trademark for it? Computer software; computer hardware; computer hardware peripherals; computer hardware accessories; computers; laptop computers; tablet computers; computer mice; computer keyboards; mobile computers; handheld computers; mobile phones; mobile phone peripherals; mobile phone accessories, mobile phone communication devices; handheld mobile digital electronic devices capable of providing access to the Internet and for the sending, receiving, and storing of telephone calls, faxes, electronic mail, and other digital data; parts and accessories for handheld and mobile digital electronic devices; parts and accessories for mobile telephones; network communication apparatus; electronic communication equipment and instruments; telecommunications apparatus and instruments; telephones; wireless communication devices for voice, data or image transmission; pedometers; multifunctional electronic devices for displaying, measuring, and uploading to the internet information including time, date, heart rate, global positioning, direction, distance, altitude, elevation, speed, pace, steps taken, calories burned, routes, navigational information, weather information, temperature, wind speed, changes in heart rate, activity level, hours slept, quality of sleep, and silent wake alarm; multifunctional electronic devices that link to mobile phones and devices to control volume and notify users of incoming calls or messages, mobile telephone software, computer software for use on handheld mobile digital electronic devices and other consumer electronics. So, you can see this most recent application extends the surface brand (if it is Microsoft, of course) into, importantly (1) Mobile Phones (2) Wearables in the nature of activity trackers. Computer software; computer hardware; computer hardware peripherals; computer hardware accessories; computers; laptop computers; tablet computers; computer mice; computer keyboards; mobile computers; handheld computers; parts and accessories for handheld and mobile digital electronic devices; stylus for tablet computer. The lawyers don’t match. So, like most big companies, Microsoft tend to use the same lawyers all the time, but here, the applications that have been made outside of Slovenia are made by different lawyers than the ones Microsoft usually use. You’ll recall that in relation to ‘Magic Toolbar‘ one of the bits of evidence was using the same lawyers in three countries outside of the Global WIPO Application. That’s very unusual, and very suspicious. It would mean that if Microsoft is behind these applications it has gone to extraordinary lengths to try and hide them. Like, really extraordinary. It doesn’t fit Microsoft’s pattern. So, you’ll see above that they have applied for ‘Surface Laptop’ and ‘Paint 3d’. They have lodged these applications in a country that doesn’t publish their applications online (which is how Apple, Google and pretty much all companies that are trying to hide their trademarks do it) and have applied in their own name. Those 2 applications in Microsoft’s name are registered in the same country for priority for the purposes of the Paris Convention as many of their previous applications. That is Microsoft’s pattern. Apply for trademarks in their own name in a country that doesn’t publish the applications in the international databases, then use the Paris Convetion to use that base application as the priority date. The sequence of events I’ve outlined above totally departs from that pattern significantly. In the many Microsoft applications I’ve checked, they have never used a Dummy Corporation like this, and never in Slovenia in this way. So it’s a tough call. My view is that on the balance of probabilities Microsoft is probably still in fact behind the applications for “Surface” (with the expanded range of goods covered) “Surface Studio”, “Surface Dial” and “Dial”. It just seems marginally more likely than any other alternative explanation I can come up with, if all the facts are as they appear to be. If it is Microsoft, that opens up the possibility (not probability I hasten to add) of a a desktop called the Surface Studio being announced on Wednesday, and also that a new ‘surface’ branded fitness tracker may be announced, and possibly even a ‘Surface’ branded phone. But that’s pure wild and idle speculation on my part. I haven’t watched any of the product launches I’ve blogged about so far, but I’ll be watching this one. What do you think, let me know in the comments? PS – Oh, remember the Trademark Application for ‘Alien Surface’ that Microsoft lodged an objection to? Guess who acted for them in filing their objection less than 6 months ago on 03 May 2016?? Yup, you guessed it – Živko Mijatovic & Partners d.o.o. (through their Spanish office in Alicante). ZIVKO MIJATOVIC & PARTNERS, d.o.o.